Get in on some fun pocket slot spinning action! FREE STARTER CREDITS! And... FREE HOURLY & DAILY BONUS! The more you come back the more FREE Credits you will earn! 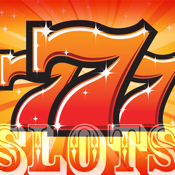 Fun slot machine graphics, Game Center for high score battles, consistent payouts, and more! Disclaimer: This product is intended for use by those that are of legal age in their country for gambling style games. This is for entertainment purposes only. No real money gambling.